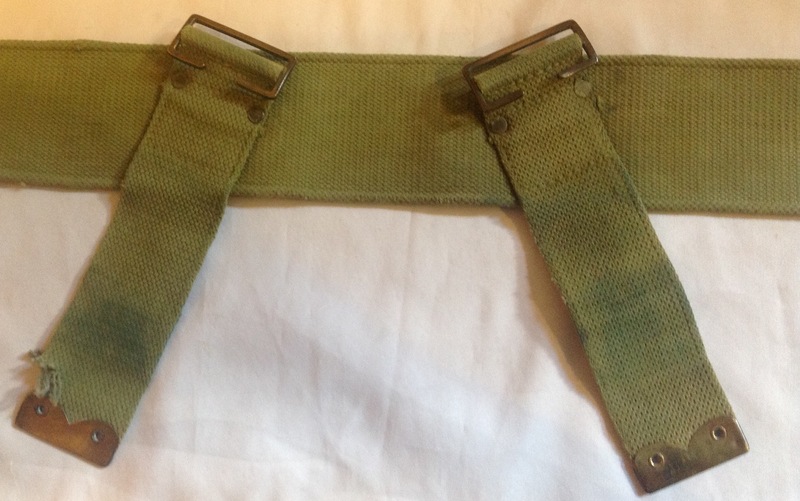 These are interchangeable, and each consists of a strip of webbing 50 inches long and 2-inches wide. 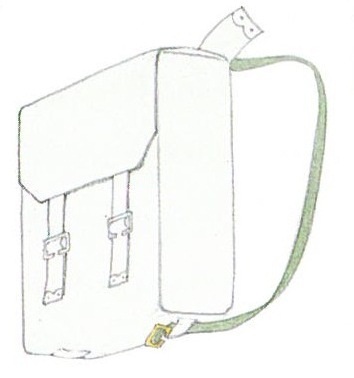 Each brace is provided with a sliding buckle for the attachment of the pack. 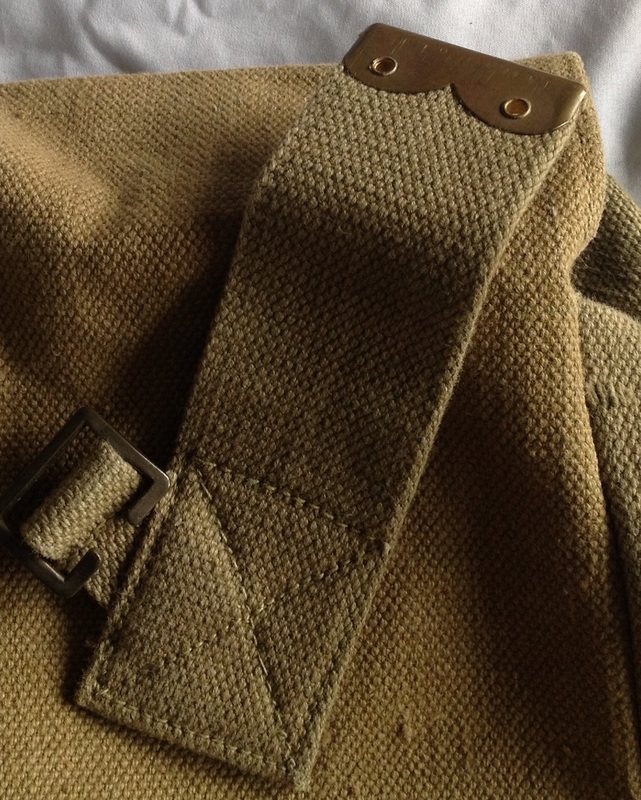 The pack is secured to, but must not hang from the buckles. 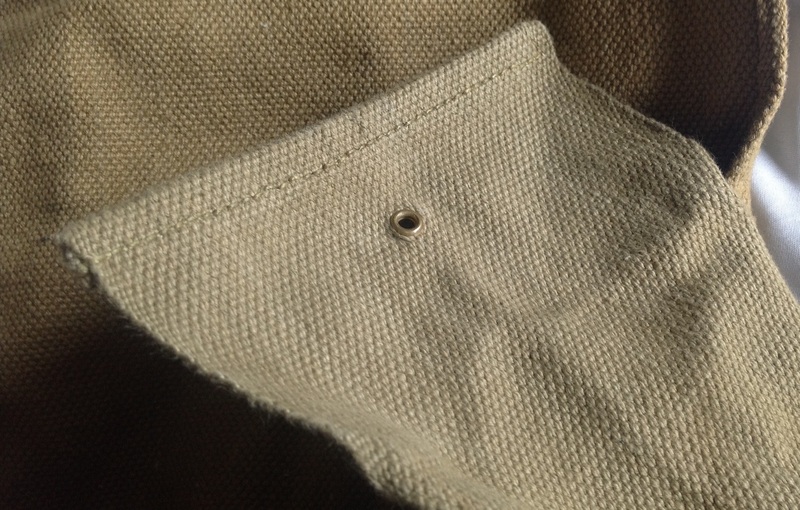 The ends of the braces are reinforced with eyeleted brass tips to prevent the ends form fraying in use. 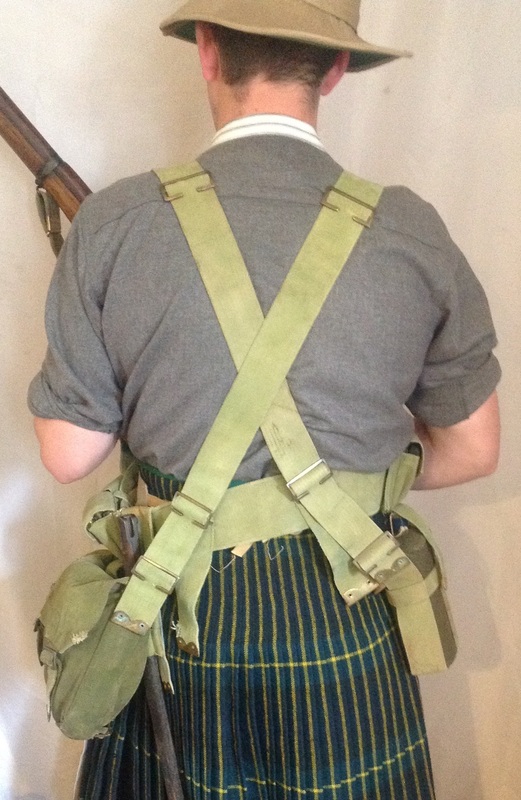 The rear of one of these braces has a regimental stamp of KRR: This stands for the King’s Royal Rifle Corps, the number 5600 indicates that the owner was a pre-war regular who had joined the regiment as early as 1903. 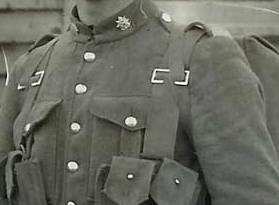 Sadly no maker’s marks are visible on either of these braces, but that is not unexpected considering they had been used and are probably more than a hundred years old. 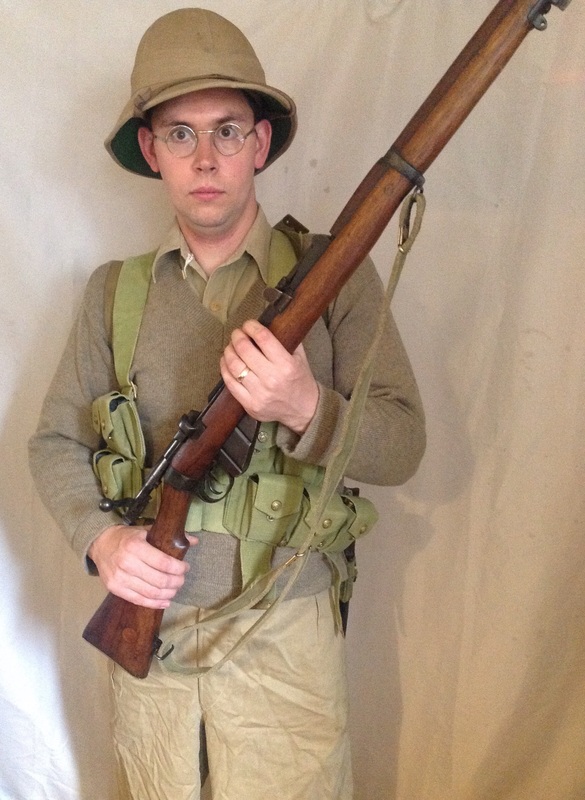 This entry was posted in 08-Webbing, British Army, Webbing, WW1 on March 12, 2016 by hatchfive. 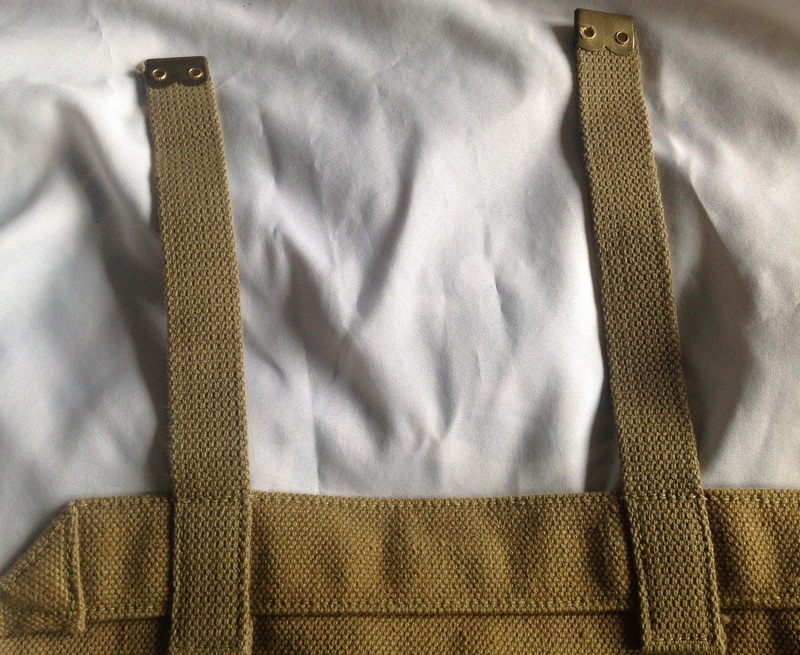 Waistbelt: This is issued in two sizes, large and small, the overall length of the webbing being 48 and 40 inches respectively. 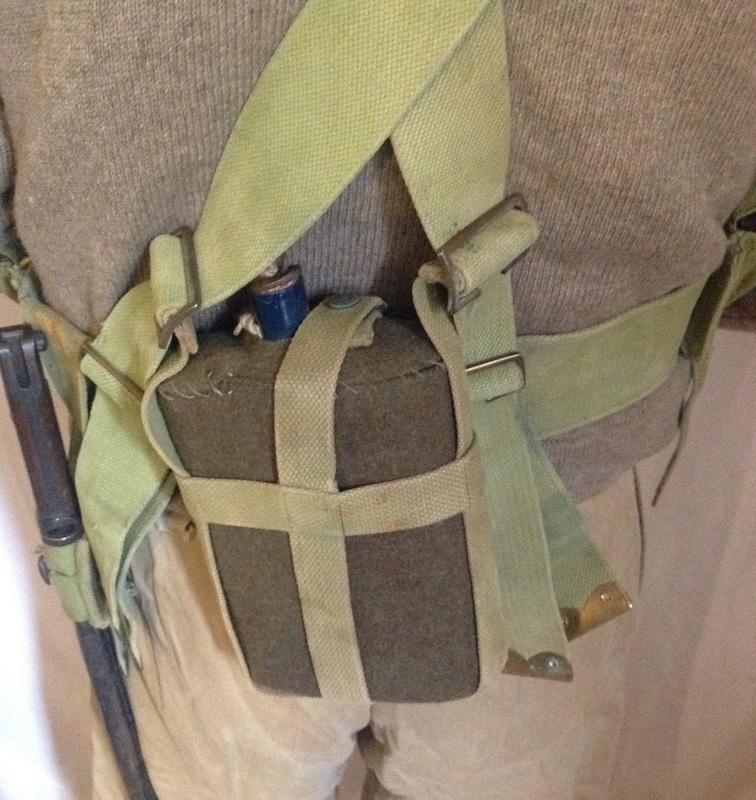 The width in each case is the same, viz., 3 inches. 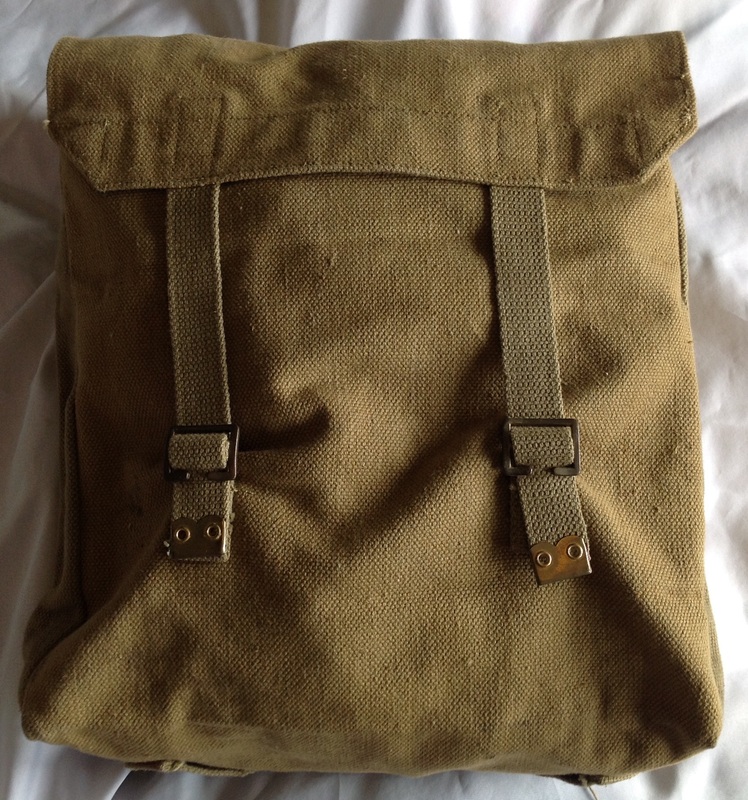 It is fitted with a large buckle in front and with two smaller buckles and two end pieces in the centre of the back. 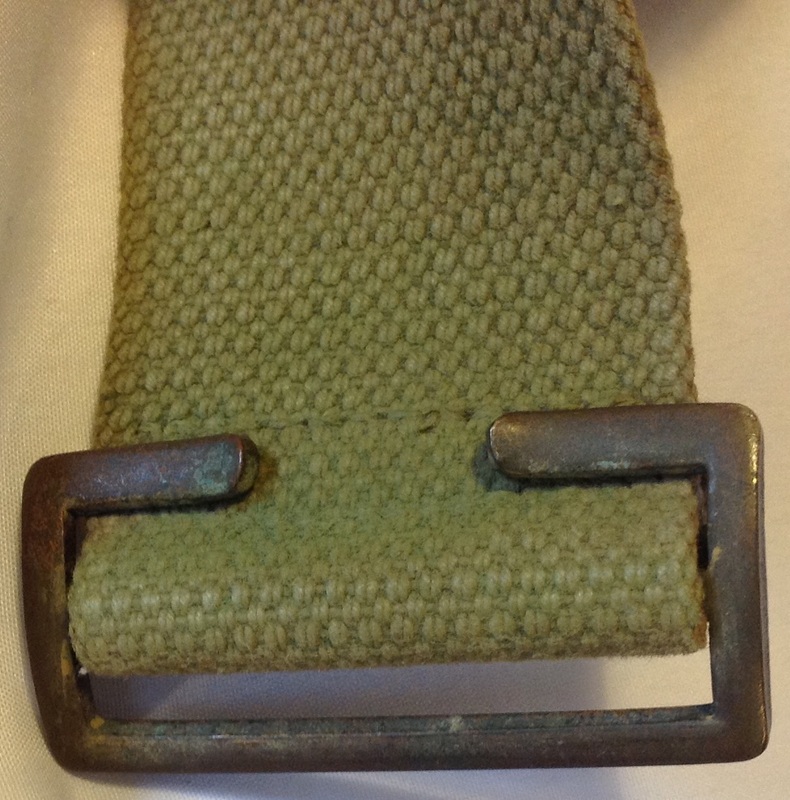 The length of the buckle is adjustable about the buckle end. 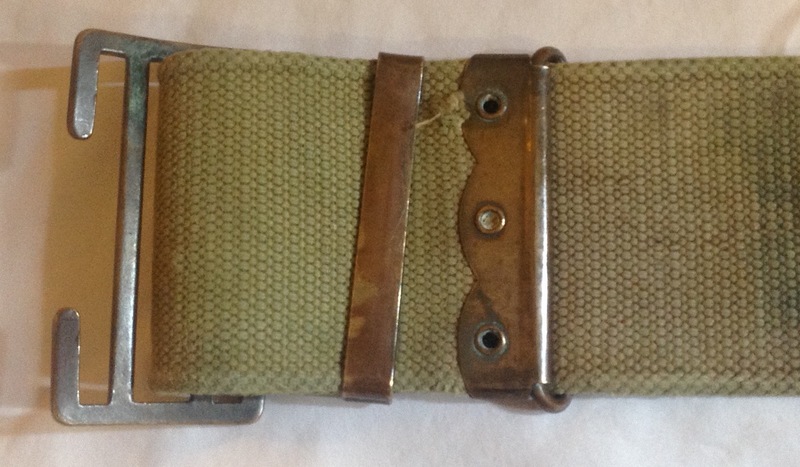 The initial sizes of the belt were expanded in 1909 to include a 44 inch medium sized version. 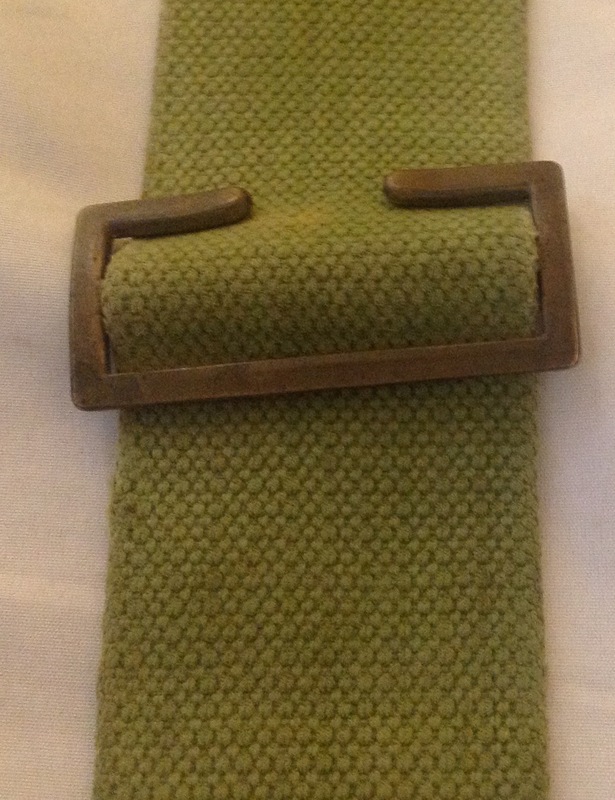 This example is a large, as indicated by the large ‘L’ stamped on the inside of the belt: Also just visible is a /|\ mark, a date of 1918 and a makers stamp for I believe MW&S which is Martin Wright and Sons Ltd. 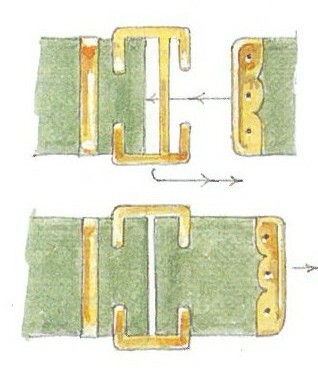 There are several different ways to fasten the buckle on the 08 webbing, the simplest method illustrated below: Other methods tucked the loose end of the belt behind to neaten up the appearance: The straps on the back of the belt were also folded back on themselves to neaten the appearance when the belt was worn on its own. 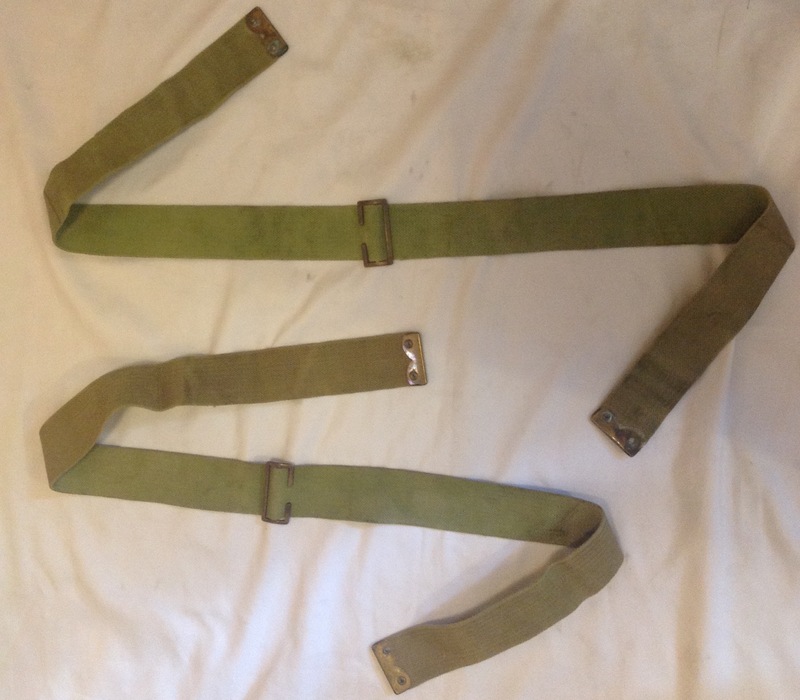 These belts were popular and produced in large quantities for thirty years so they are not too hard to find- reproductions are also available but the webbing is often thin and does not stand up to use with the heavy 08 pouches as well as an original. 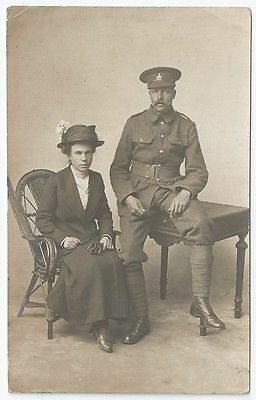 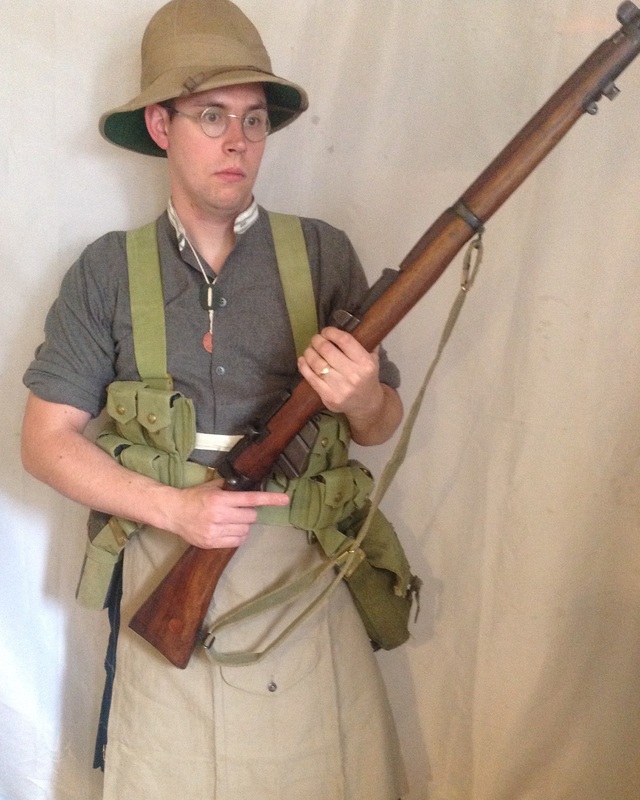 This entry was posted in 08-Webbing, British Army, Webbing, WW1 on February 22, 2016 by hatchfive. 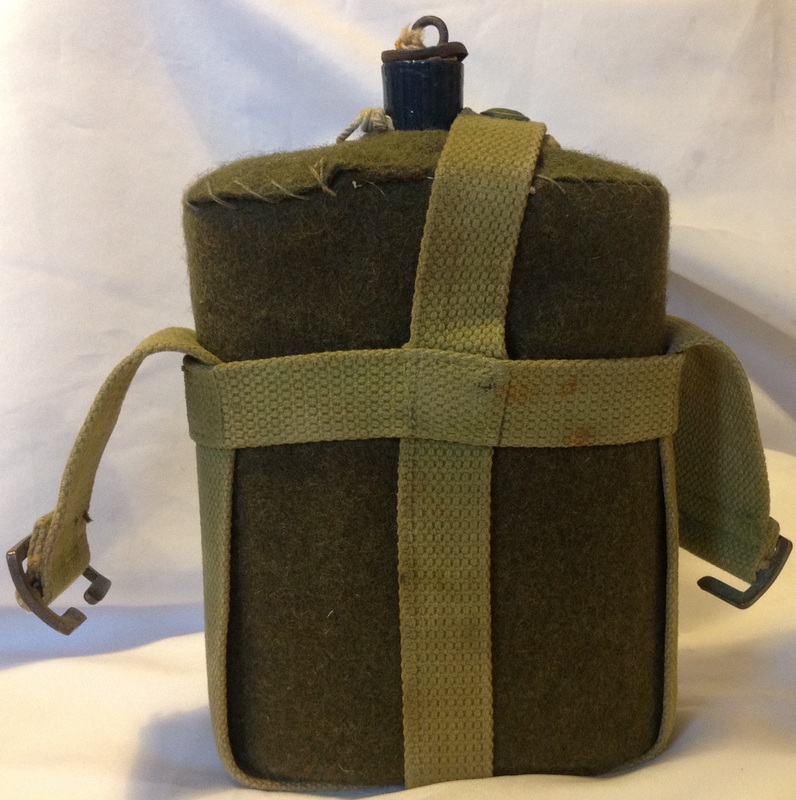 Waterbottle Carrier- This consists of a skeleton framework in which the waterbottle is inserted and secured by a snapped on retaining strap. 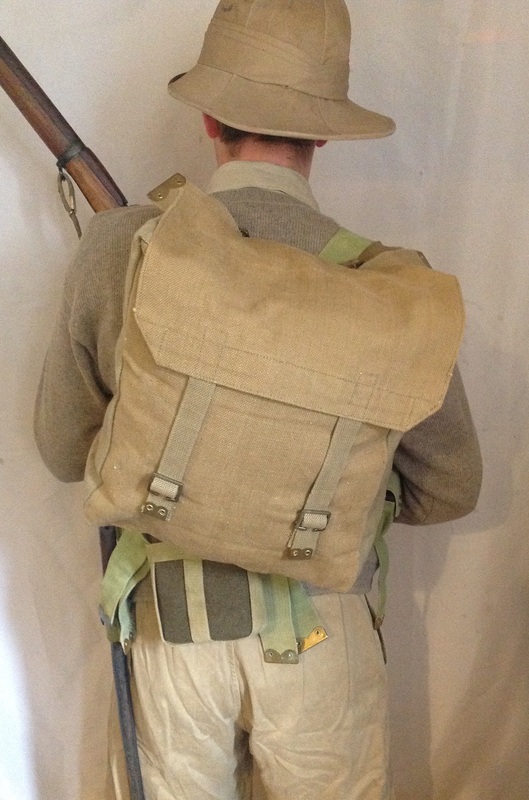 The carrier is fitted with two buckles for attachment to the end pieces of the equipment and has a short extension piece and snap fastener for use when the waterbottle is carried on the front of the haversack. 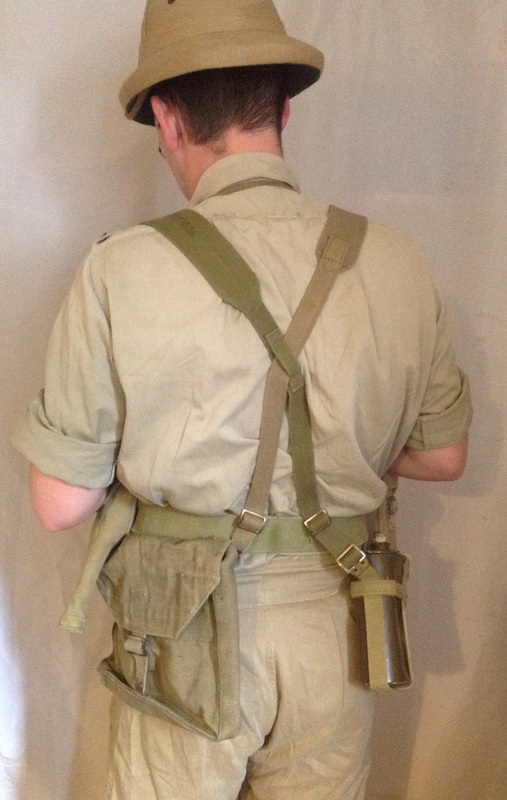 This entry was posted in 08-Webbing, Inter-War, Webbing on December 2, 2015 by hatchfive. 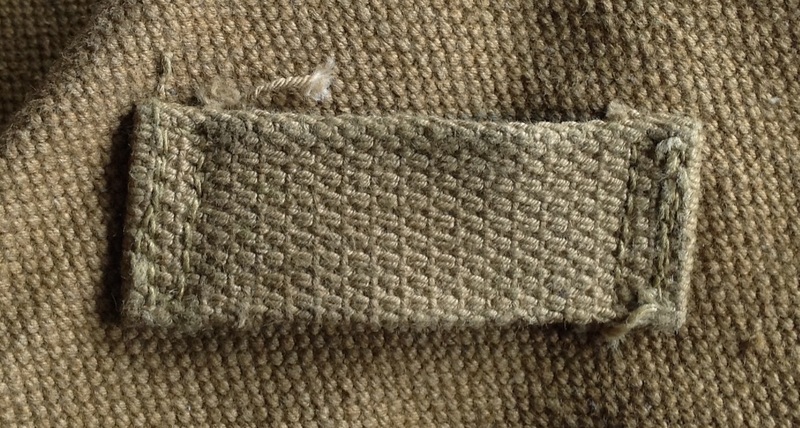 This method of carriage had been used informally by troops in India for many years, but was formally recognised and listed in the fitting instructions for the 37 pattern webbing system. 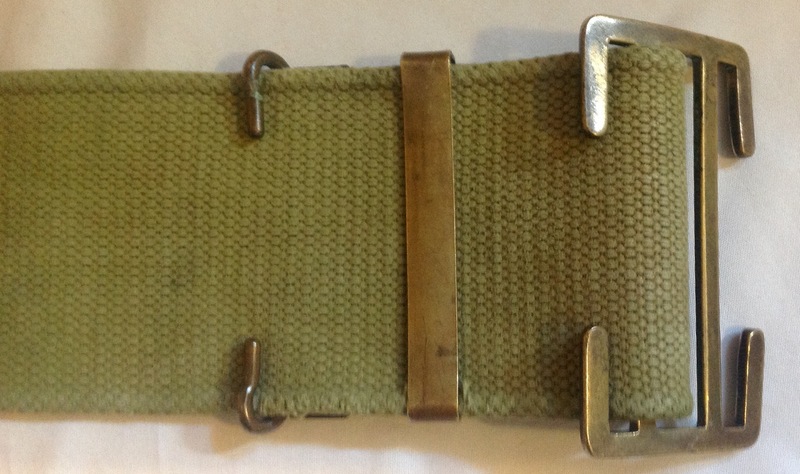 As the straps are thin and would dig in, it was common to hook them under the 2” twigg buckle on 08 webbing to increase the comfort level: This pack is dated 1942 and marked ‘CP’ which indicates it was made by Caoutchouc Products Ltd: The 1937 pattern fitting instructions list the following contents for the large pack: Greatcoat, Cap Comforter, Holdall containing Laces, Comb, Toothbrush. 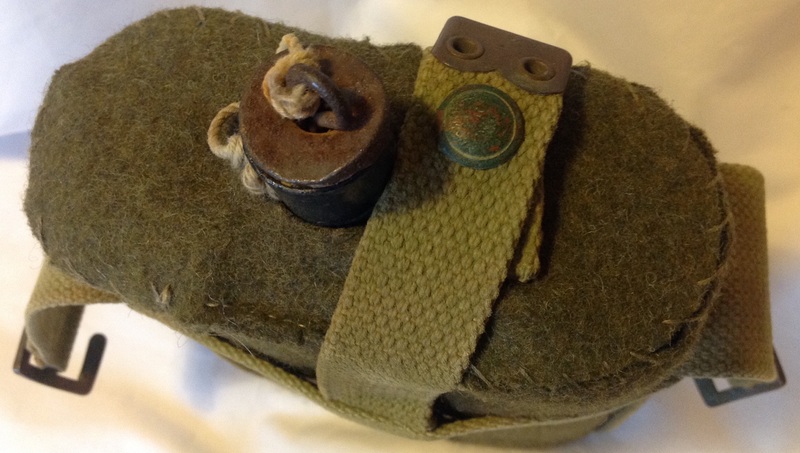 Razor and Case, Shaving Brush, Housewife, Socks, Soap & Towel. 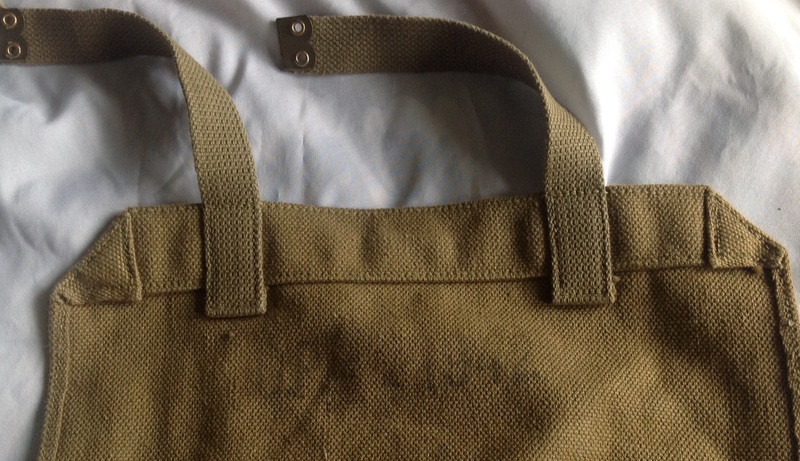 Additional or alternative contents could include: Ground Sheet, Waterproof Cape, Jerkin, Denims, Gas Cape (when not carried on Haversack), Underwear (vest and underpants), spare Shirt, PT kit (vest, shorts, plimsolls), Gloves/Mittens, Boot cleaning kit (Polish/Dubbin, Brushes). 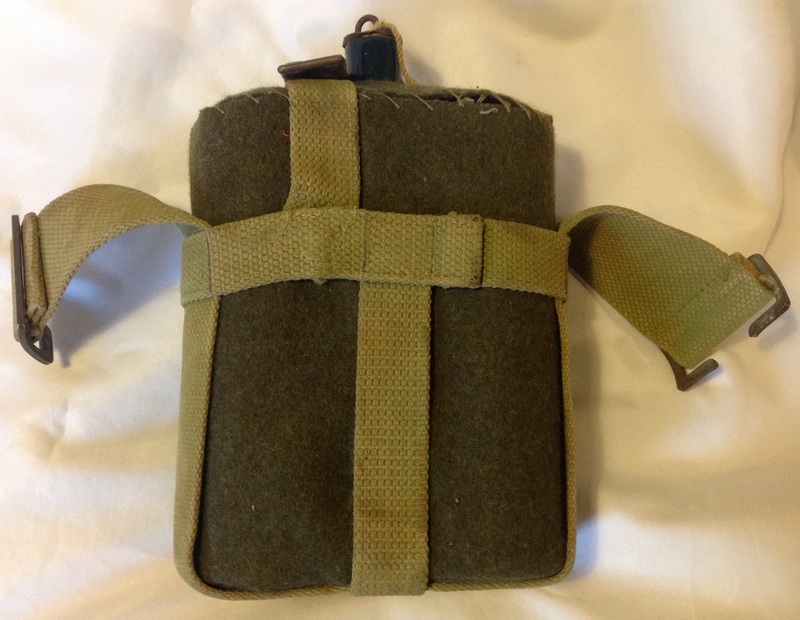 This should weigh 11lbs 1oz according to the fitting instructions; in reality many of these items of small kit would be carried in the small pack instead and other items stowed in the large pack as required. 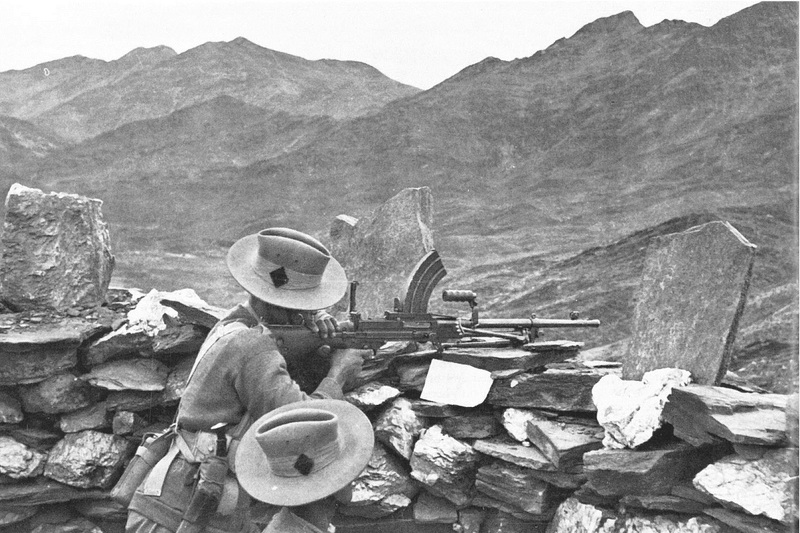 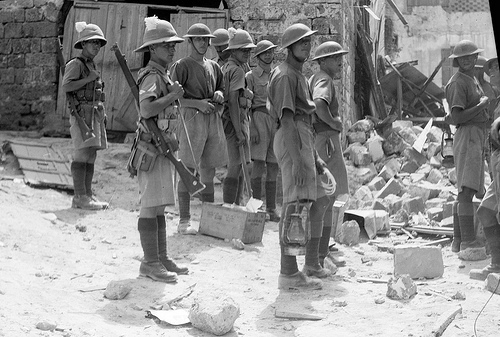 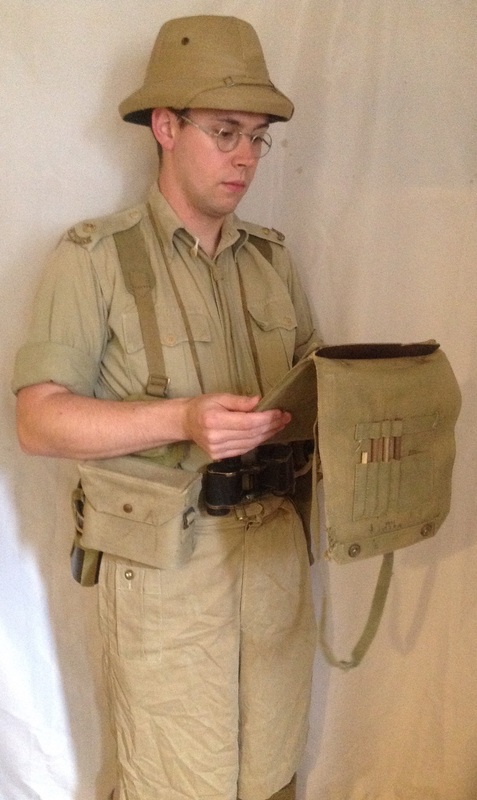 This entry was posted in 08-Webbing, 37-webbing, British Army, Webbing, WW1, WW2 on August 26, 2015 by hatchfive.